I can hear those words echoing in my particularly empty head this morning. The lovely Irish brogue that welcomed each of us, week after week, is a beautiful thing but, unfortunately, now a warm memory. The Reverend Joseph Aidan Nolan left us a few days ago, October 5th, 2015, from complications related to his diabetes. He was 79 years old. Most people called him Fr. Nolan, but to me he was Fr. Joe. I’ve often grown close to our priests, over the years, cities, and parishes on my journey. To me, “Fr. Nolan” was just too formal for him. He was an ordinary Joe. Not that there’s anything less than sacred in ordinary people, in fact we had discussed this very thing not long ago in his office. We meet Jesus in ordinary people, in our everyday encounters. We are the only Jesus many people will ever meet. And as such we must remember that we are always in the presence of God, and treat each other with respect and love. Anyway, because I tend to see priests also as ordinary people, I think I’m probably pretty forgiving of faults and quirks in those who have devoted their lives to serving us. Or at least I try to be. When in the Sacramental context, they most certainly are acting “in persona Christi,” but outside of this, he was clearly a human being. He loved golf, and despite his near blindness could drive a ball further and straighter than anyone I’ve ever met. Fr. Joe was old school Irish, and most definitely enjoyed things going his way, and, like the rest of us, had certain propensities. Which brings us to the human nature. By being human and making mistakes, those leading us show what it’s like to be human, and vulnerable. And forgiving, and forgivable. And endearing. I’m going to miss those homilies underpinned with peaks and valleys of Fr. Joe’s blood glucose. The “tip-off,” to those of us constantly looking for such stuff was him parting his vestments to look down at his glucometer on his belt. He must have known something didn’t feel “just right.” But so did we, as on “those days” when his level was too low, his gait would change, and the volume and emphasis of the points he was making would reach fever pitch. I’m not the only one I noticed positioning themselves on the edge of their seat, positioned for a quick dart to catch him, should he pass out and fall on the altar. Once, I remember him on a particularly embarrassing morning, acknowledging by pointing out his nephew in the congregation, “Wearing the red shirt, OR WHATEVER COLOR THAT IS!” (Fin’s shirt was not red). And he went on and on for some five minutes, ranting and raving about how much he loved this man, much to Finian’s embarrassment. Please know I’m not making fun of Joe Nolan. These were endearing things that we learned to know, accept, and love. Truly love. Because although there were a few of these moments, Fr. Joe was as sharp as a tack, until his very last day. Old school Irish indeed, Fr. Joe would end every Sunday Mass with a joke. Something else I’ll always miss terribly. He was quick to fault himself, and felt very human at times. He used to preach an entire homily from the center of the altar, without any notes, and had the entire thing memorized, with breathtaking accuracy and recollection. Recently, he’d begun reading from behind the ambo, where he could refer to his notes, but still had most of it memorized. He shared with me that once he had “lost his place” in what he had memorized, and was mortified. He took his preaching so seriously, that he never again gave a Sunday sermon without notes, because he was so concerned that he might give a wrong message. “There are souls at risk!” A few weeks later, on a Wednesday, I visited him in his office for a while, and he asked me how to phrase a point he wanted to make in his homily for the next weekend. I worded it in a way that I felt was particularly poignant, but he thought for a few minutes, then said, “No, no, Beel, that’s not really where I’ll be goin’,” and read what he decided on instead. I was taken back. I like to think I can turn a phrase and make a point, but his was much better. He was 79 and the sharpest knife in the drawer. And he was so excited about our new Pope. He went on and on about how beautiful it was that he was making people squirm and reach outside their comfort zone. He has the humility of the common man, and teaches us what love and being Christ-like really means. When I suggested that he was much like our new Bishop Noonan, Fr. Joe said, “You have no idea how right that is. Bishop John Noonan is like you and me, and it’s so humbling how he leads with such love and compassion.” He went on to share a funny story with me (again) of what a really good friend the Bishop was to him, involving his not recognizing him in public, because of his bad eyesight. Good friend indeed. When Bishop Noonan heard the tragic news that our dear Father Joe had fallen, he cancelled his schedule for the day, and drove over from Orlando to administer last rites; and sit with him. I’m told he sat with him for most of the day, holding his dear friend’s hand and praying. Fr. Joe came to us at Immaculate conception in 1989, after nearly two decades as pastor of Holy Redeemer Church in Kissimmee, FL. He came to that then tiny parish in 1972, and over the course of 17 years had rebuilt the Church, and grown it from 200 families to over 2000. Joe Nolan was born in Mullingar, exactly in the center of Ireland, in 1937. After ordination and 8 years of service in the Diocese of Hexham and Newcastle, he served at Mary Magdalen in Maitland for 2 years, and then at a year at Ascension in Eau Galle for one year, prior to being named Pastor at Holy Redeemer, before coming here. Father Nolan then went to Rome to study for a month at the Vatican, and then on to the Holy Land, where he had, what he described as the highlight of his life. He met Pope Saint John Paul II, got to shake his hand, chat for a few minutes, and receive his blessing. When he returned to the United States, he learned that he’d been transferred, and had been appointed to Immaculate Conception as pastor; it would be his final assignment, and he would serve us for 26 years. He’d always get a bit teary describing how good everyone had been to him over the years, and from the pulpit often told the congregation that he’d been so very blessed, that we were the best parish, anywhere. After the Church enlargement, he pushed hard for funding for beautiful new stain glass windows (which I discovered he had been so proud at Holy Redeemer also), and was so excited about how beautiful they’d be. Buts shortly after the organ, and then a consistent theme for the next ten years would be his emphasis on the youth of his beloved parish. He’d regularly pop into Sunday and Wednesday CCD classes, and open his back yard up for the annual picnic for them, complete with music, a bounce house, and fishing from his dock. One year he arranged for jet-skis! Father Nolan had received special dispensation from the Bishop that ours would be the only parish in the diocese to have high schoolers trained as Extraordinary Ministers of the Eucharist, and distributing communion. He realized that our young people were our future, and he felt driven to reach out to them. Every year Fr. Nolan’s annual concert event served to fund scholarships for the youth of his parish to attend Catholic School if they desired. He’d bring in cabaret style entertainment from Ireland, which was quite popular with many of the retired in our community and “1964,”a Beatles tribute band a couple of times, which drew people for a hundred miles. Some of my fondest memories include my then pre-teen daughter Camille as a guest performer, Irish dancing with the Tony Kenny Variety Show professional dancers. And, more recently, I’ll never forget the entire family dancing for almost two hours to the Beatles music, in Fr. Joe’s back yard. Many of us have so many fond memories of Fr. Joe, but this is my blog, so I’ll share some of mine. First communion, confirmations, weddings and compassionate consolation and reconciliation to all of us in the confessional. Keeping me from bashing my head against the wall in anguish and regrets over so many things involving my first marriage. He’d humbly agreed to go to a different church, one where so many of his parishioners had traveled seeking more contemporary services, to con-celebrate with Fr. Tony, the funeral Mass for my wonderful son Cullen. And he would be my biggest advocate for the diaconate, and told me he’d be “lookin’ down on me an’ smilin’ at your ordination.” I had no idea what he was talking about – I truly thought Father Nolan would live to see that day. So many times over the past three years, when Fr. Nolan would say a Mass in honor of Cullen, when announcing the intention of the Mass from the altar, he’d pause for the memory. He’d shake his head in bewilderment of God’s plan, lamenting the loss of a boy he truly remembered so well, as altar boy, lector, and simply the mischievous little fellow, and share with the entire congregation exactly who we were remembering and praying for. There’s going to be so many things we’ll all miss. I’m so sad. I’ll never again hear (for the tenth time) the story of a mother’s love, Fr. Joe fondly remembering from the pulpit when he was a child on a bicycle, off to the market for eggs. He was so proud that his mother had entrusted him with such an important task – to take the few dollars she had been able to save of the weeks to go get eggs for Easter. And so, when he arrived home, she opened the basket and every single egg was broken, except one. Little Joe Nolan was horrified, and very scared, for these were the only eggs the Nolan children would be able to afford for Easter, and his careless riding had broken them all, except one. As an example of our Lord’s loving forgiveness, mercy, and sense of humor, his loving mum reached in for the only unbroken egg, and with an ear to ear smile, and a loving laugh he claimed he could still hear, smashed the remaining egg on the top of his head. Every time he told that story, he laughed like it had just happened. Enjoy this time now with your mum. We’ll miss you so very much, Father Joe Nolan. 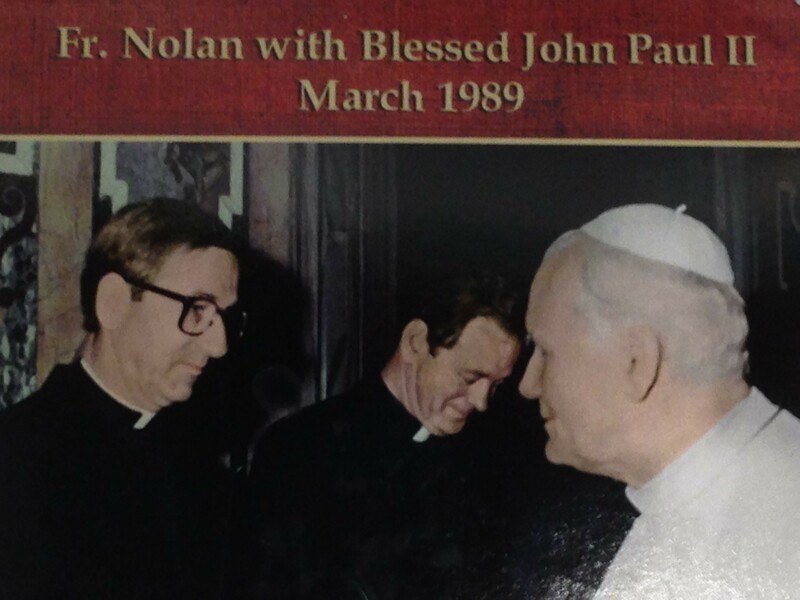 This entry was posted in Faith & Religion, Worship and tagged Bishop John Noonan, Bishop Noonan, Father Joe, Father Joseph A. Nolan, Father Nolan Obituary, Fr. Joe, Fr. Joseph Nolan Obituary, Fr. Nolan, Fr. Nolan Obituary, Immaculate Catholic Church, immaculate conception, Joseph A Nolan, Joseph Nolan, Obituary, Reverend Joseph Nolan. Bookmark the permalink. Thank you for sharing your love & your loss. He is surely with your son looking out for you like a guardian angel.